Calla lilies are handsome enough to grow for their foliage alone, but when the bold, single-petaled flowers unfurl they are sure to attract attention. Learn how to divide these dramatic tropical plants in this article. 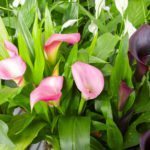 Should You Divide Calla Lilies? How often should you divide calla lilies? Calla lily division is only necessary when the clumps start to decline, but if you want more rhizomes to fill in the garden, it’s safe to divide them every three to five years. If you divide them too often, however, they will never quite reach their full potential. In late winter or early spring after all danger of frost has passed. In late summer or fall when the plants have finished blooming for the year. Most growers prefer to divide calla lilies in spring, especially in warm climates where you can leave the rhizome in the ground year round. In cooler areas, you might prefer to divide the rhizomes in late summer or fall when you dig them up for winter storage. Dividing calla lilies is not difficult. Lift calla rhizomes in fall after the foliage turns brown and pulls away from the roots easily. Slide a shovel under the roots and pry upward to lift the clump. Remove any remaining foliage and brush off the soil. Cut or break apart the rhizome, making sure each section has at least one eye. Let the rhizomes dry for a day to form a callus over the cut before replanting. If you live in an area cooler than USDA plant hardiness zones 8 through 10, you’ll have to store the rhizomes and replant them in the spring. Allow them to dry in a well-ventilated area for two to three days. Brush off any remaining dirt with your hands or a dry paper towel and then dust the bulbs with bulb dust to prevent rot. Store them in a paper bag of peat moss or vermiculite in a cool, dry location. In late winter or spring, chop apart sections of the plant by driving a spade between them at the first sign of new growth. Lift the sections you want to move and replant them right away. Add soil around the plants you leave in place and firm it up with your hands. New gardeners might find this method for dividing calla lilies easier since you don’t have to identify the eyes.